The first stage of almost every successful penetration test is the reconnaissance phase. During this phase of an engagement we scour publicly accessible resources for information about the target that will provide insight and direction for later phases. We look for information that was made public intentionally, and sometimes unintentionally, that tells us more about the organization than we knew before. All of these used to be very manual processes. In the past, shortcuts such as the Google Hacking Database tried to simplify the process, but it was still very time consuming. Now that’s changed. Installing Recon-ng is extremely easy. It’s been tested on OS X and several Ubuntu derivatives, but should also run on most linux distributions once the 3rd party libraries are complied correctly. For this article, we’ll install it on the Samurai Web Testing Framework which is based on Ubuntu. I’ll be placing the tool in the /usr/share/ directory but you can install it anywhere you’d like. To begin, enter the following command to pull down the latest version from the Git repository. Now it’s as simple as changing into the recon-ng directory and launching the program. The script loads immediately and shows us the recon-ng header and version number (v2.2013.10.30.1535 as of this blog post.) It also offers several different categories of modules to assist in your reconnaissance mission. At this point we can type ‘help’ to see a list of available commands, or begin by actually loading specific modules. I’m going to start by seeing what I can learn about the Secure Ideas company. One module that might help scrapes the Jigsaw.com website for employees. We can load the module using the following command. It’s important to note that recon-ng also supports autocomplete just about everywhere you’d expect it. So once I type “recon/contacts/gather/http/” I always forget what comes next. If I type “w” and hit TAB, it’ll autocomplete “web” for me. Then, if I don’t remember the final name of the module, I can hit TAB twice to see all of the modules in this section. Now that I have my module loaded, I need to find out what data is required to start the search. “Show options” displays each of the parameters for the module, their current values, and whether they are required. For this module, only the company name is required, so I’ll set that and then start the module. 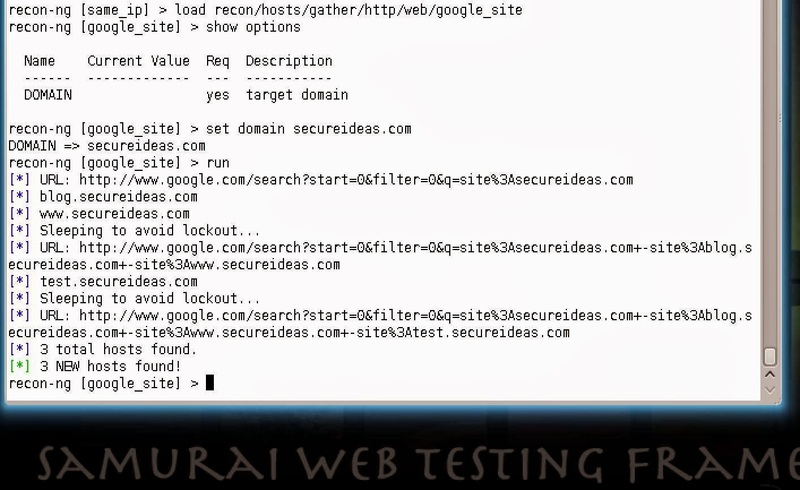 Another fun module searches Google for additional subdomains of the primary domain. This module only requires a domain name to search and continues searching until it has enumerated all of the subdomains that Google knows about. Another neat feature is that the module has built-in functionality to delay queries in order to prevent being blocked by Google. While recon-ng includes a lot of modules that query free sources, it also has a number of modules that require API keys or memberships to access the data. In order to acquire those APIs, the project maintains a list of module and directions here. I see following error when trying to run freegeoip. I am running kali linux in vmware with bridged networking mode.